And when the saints go marching in, the public comes out–at Traditional Spanish Market held on the historic Santa Fe Plaza on the last Saturday and Sunday in July (this year on July 29 and 30). More than 200 artists (both adult and youth) display a litany of saints—from Agnes to Ysidro. Can’t decide? There’s always St. Jude, patron of hopeless causes! A Spanish colonial tradition, saintmaking dates from the 1700s. Lacking statues and crucifixes in the outback missions, Franciscan friars taught the settlers to carve santos (saints) and paint retablos (images on panels of wood). The art soon adorned homes as well. In isolated villages where a padre’s visit was rare, the art kept the faith burning. Three centuries later, saintmaking is a revered craft, perpetuated by descendants of the original santeros and “santeros-come-lately.” This religious folk art, sought by collectors and people in the pew, hangs everywhere from the Vatican to rustic adobes to billion-dollar mansions to convents and monasteries. Everyone loves these saints! Like Michelangelo, who saw figures waiting to be chiseled out of blocks of granite, santeros see saints in wood. One day in 1990, Margarito R. Mondragon of Las Vegas, New Mexico, was gathering firewood when he saw the face of Christ in a piece of red cedar. He sensed the call of God and became a santero. At left, in the photo above, is a curved retablo of San Pascual, patron saint of kitchens and cooks (legend says if you hang an image of San Pascual in your kitchen, your cupboards will never go bare!). At right are bultos (hand-carved statues) of St. Francis and St. Clare, with the Chapel of Our Lady of the Angels at Portiuncula as a backdrop. Pass the paintbrush and the chisel: the art of saintmaking shows no sign of dying soon. Grandparents teach their grandkids, and santeros mentor up-and-coming artists. Youth artists Adriana Gonzales, left, and sister Liberty learned the craft of painting retablos from their grandfather, Roberto Gonzales of Old Town Albuquerque. A collaborative effort, their award-winning altarpiece, above, features many of New Mexico’s beloved saints, including Archangels Michael and Raphael, Our Lady of Sorrows, and La Conquistadora (also known as Our Lady of Peace). In Spanish colonial style, painted drapes frame the images, as though the young artists are pulling back the drapes on the saints’ lives. Other popular art forms at Traditional Spanish Market include Spanish colonial furniture, bone carvings, hide paintings, colcha embroidery, precious metals, tin work, and weaving. For goodness saints, come to Spanish Market! There’s nothing like it–this bit of heaven on earth! To learn more, visit http://www.spanishcolonial.org or call (505) 982-2226. 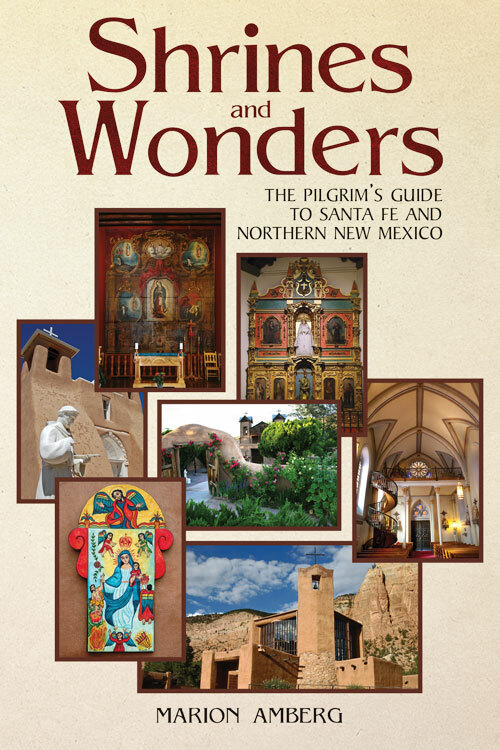 Adapted from Shrines and Wonders: The Pilgrim’s Guide to Santa Fe and Northern New Mexico. To order your copy, click on the Books tab above. A wonderful post. The photos and post are so inviting. Wish I could attend the Spanish Market. Maybe some year. Why not get a pilgrimage together and come for next year’s Spanish Market? The Spanish Market Sunday Mass is out of this world!